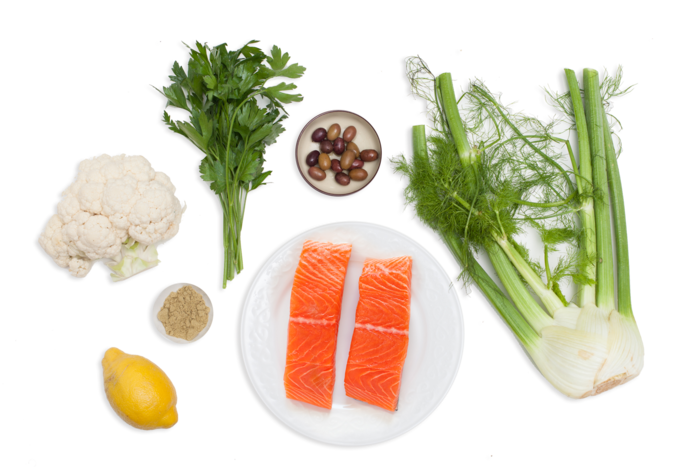 Fennel is a staple vegetable around the world and can be found in Mediterranean, Middle Eastern, and Indian cuisines. 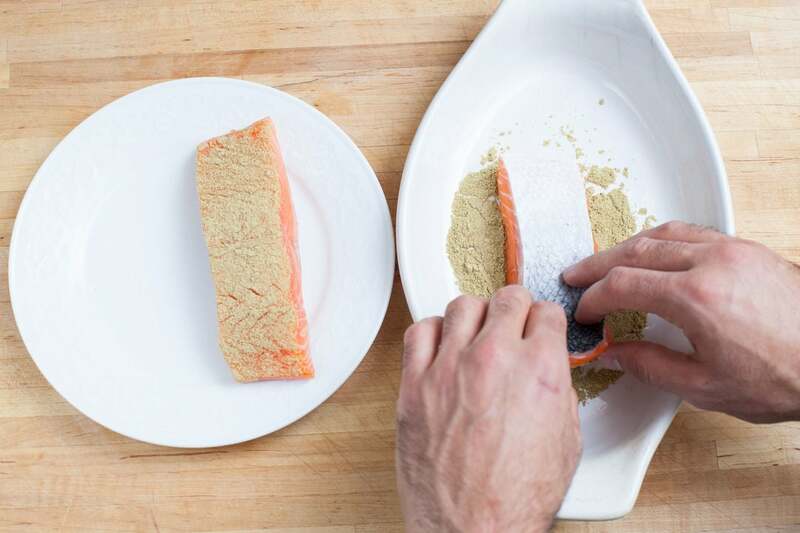 To showcase its incredible versatility and unique characteristics, we use it in two distinctively different ways: ground fennel seed is used to season the salmon, while the fresh fennel bulb and its fronds provide a light and crunchy salad on the side. Preheat oven to 500°F. Wash and dry the fresh produce. Using the side of your knife, flatten the olives to easily remove the pits. Finely chop the olives. Pick the parsley leaves off the stems. Pick the green, leafy fronds off the fennel and thinly slice the bulb. Cut the lemon into wedges. 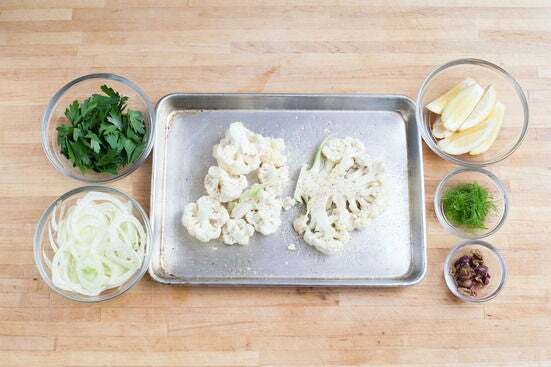 Slice the cauliflower into 1-inch-thick “steaks,” leaving the stem to keep the cauliflower as intact as possible. 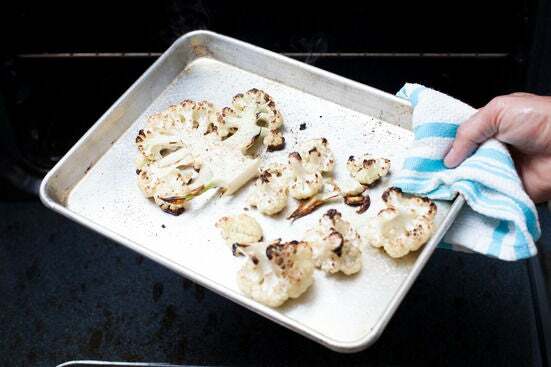 Place the cauliflower on a baking sheet, then drizzle it with olive oil and season with salt and pepper. Roast the cauliflower in the oven 11 to 13 minutes, or until browned and tender when pierced with a fork. 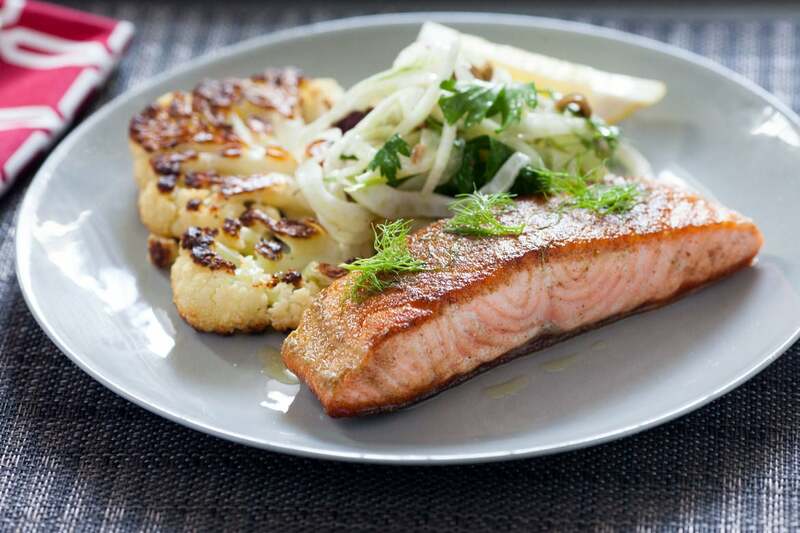 While the cauliflower roasts, coat the non-skin side of the salmon with the ground fennel seed. While the salmon cooks, make the salad. In a medium bowl, combine the sliced fennel, olives, all but a pinch of the parsley, and all but a pinch of the fennel fronds. (Reserve some parsley and fronds for garnish.) 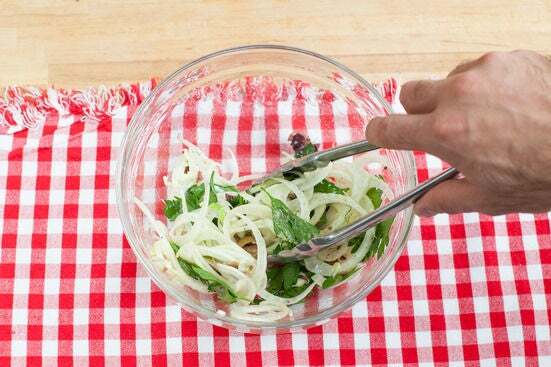 Squeeze the juice of half of the lemon and 1 tablespoon olive oil over the salad. Toss to coat and season with salt and pepper to taste. 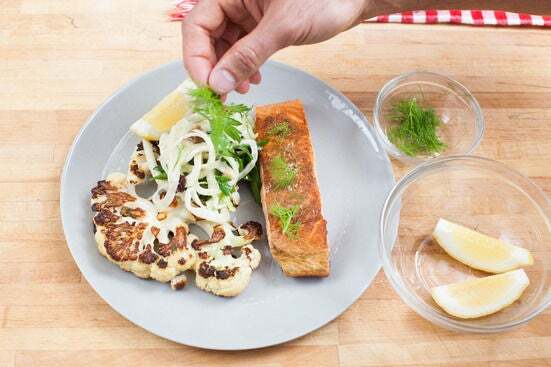 Divide the roasted cauliflower steaks and fennel salad between 2 plates. 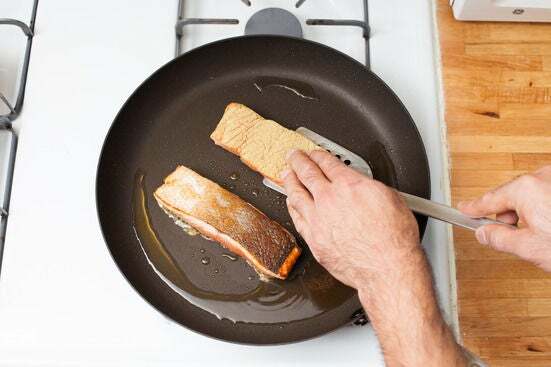 Top the cauliflower with the cooked salmon and finish with squeeze of lemon. Garnish with the remaining parsley, remaining fennel fronds, and lemon wedges. Enjoy!